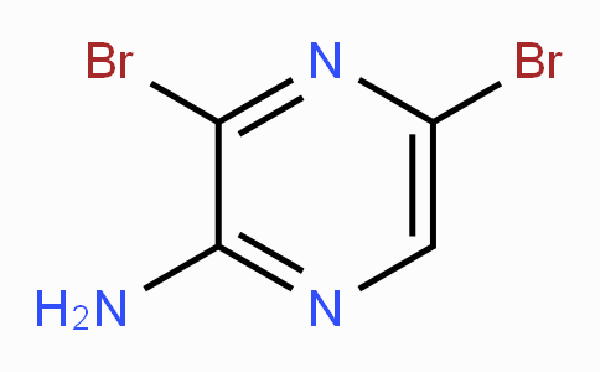 We produce and synthesize large amounts of 3,5-dibromopyrazin-2-amine, among other chemicals. Our products meet the CGMP manufacturing standards and are primarily for research, development, and chemical production. 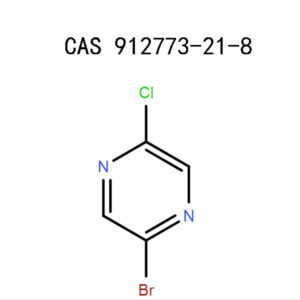 3,5-Dibromopyrazin-2-Amine (24241-18-7) belongs to the same category as aromatics, halogenated heterocycles, pyrazines, and the related building blocks. 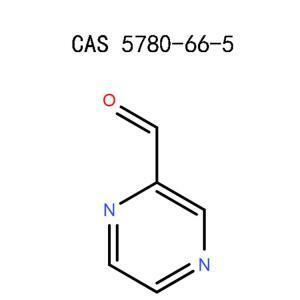 The product has a wide range of applications especially in chemical synthesis or conjugated polymers, which are useful in the detection of neurotoxins. Its reaction with sodium dicyanocuprate results in dicyanation and mono products. 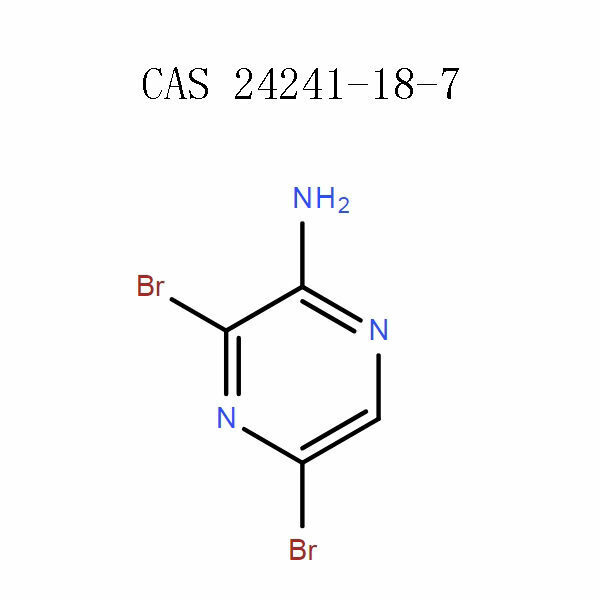 Also, if reacted with isothiocyanates, it forms 2-aminothiazolopyrazines.The synthesis of 24241-18-7 involves bromination of 2-aminopyrazine using N-bromosuccinimide. 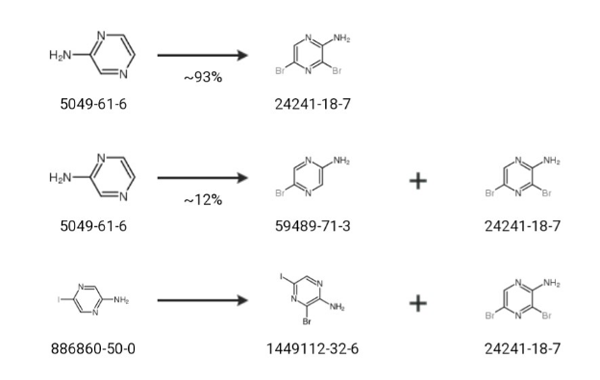 Synthesis of various products such as 3,7-dihydroimidazo[1,2a]pyrazine-3-ones, 2-amino-5-bromo-pyrazin-3-thiol, and 2-amino-3,5-bis(p-methoxyphenyl)-1,4-pyrazine. Wear suitable and approved protective equipment. Use a face mask, eye shields or safety glasses, rubber boots, and impervious gloves. The respirator should be equipped with active air-purifying filters. Work in a room with functional local exhaust ventilation, air cleaning devices, safety shower, fans, and eyewash. Relocate the victim to an area with maximum aeration, preferably in an outdoor space. If there’s shortness of breath, administer artificial respiration or use an oxygen machine. In extreme cases, get immediate medical aid. Rinse the mouth and drink half a liter of milk or water. Seek medical advice if the symptoms persist. Flush the spot with a lot of water. Continue rinsing for 15 minutes until there’s no allergic reaction observed. Get proper medical care in case the corrosion is uncontrollable. Thoroughly wash the eyes with an adequate amount of water for not less than 15minutes. 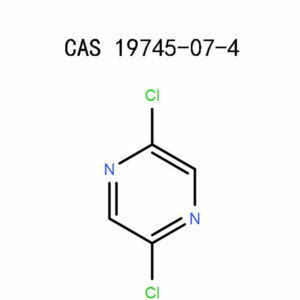 Store 3,5-dibromopyrazin-2-amine (24241-18-7) under low temperatures, in a refrigerator. Ideally, keep it under argon or an inert gas since it is unstable in light, heat, and air. Avoid exposure to high temperatures lest the product decomposes to generate toxic fumes. Always use the original packaging when storing 3,5-dibromopyrazin-2-amine. Ensure to seal and lock it up in a safe place, out of reach of unauthorized users. Control the spills or chemical leaks so that they don’t find their way into the environment. Lift the spilled chunks or absorb them with an inert absorbent and collect into a labeled airtight container. Clean up the area by washing and ventilating. Extinguish the fire with carbon dioxide, water spray, or dry chemical powder. Make sure to wear protective clothing to avoid inhaling the combustion products, which may include poisonous carbon monoxide, oxides of nitrogen, hydrogen bromide, and carbon dioxide. Dispose of 3,5-dibromopyrazin-2-amine in line with the local regulations that govern chemical waste disposal. Another means of eradicating this product is by dissolving it in a flammable solvent and burning in an incinerator. Under standard temperatures and pressure, 3,5-dibromopyrazin-2-amine is very stable. The product is unstable under high temperatures, air, and light. When subjected to heat and strong oxidizing agents, it readily decomposes into CO, HBr, CO2, and NOx. The quantity, packaging, and the components of 3,5-Dibromopyrazin-2-Amine (24241-18-7) are subject to the relevant laws and regulations. The CAS numbers do not go beyond the maximum reporting levels. Our experts have scientific experience in material and life science, chemical synthesis, chromatography, research, and the related practical fields. 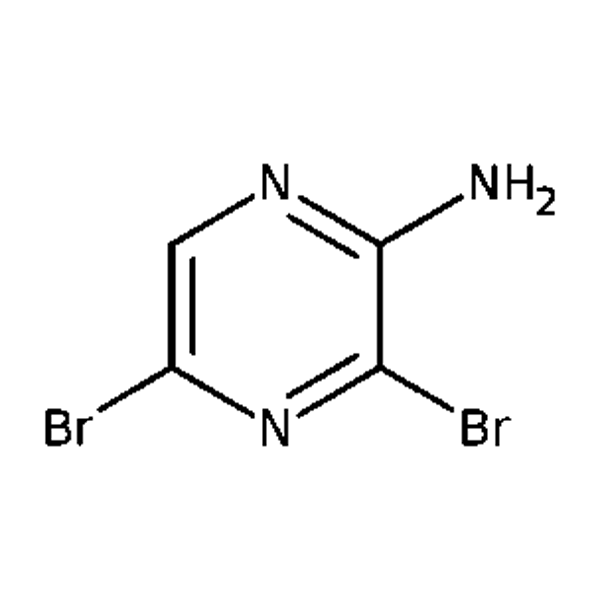 If you require 3,5-dibromopyrazin-2-amine for research or chemical synthesis, make an order from us. National Centre For Biotechnology Information, US. National Library Of Medicine, Pubchem, 3,5-Dibromopyrazin-2-Amine, Sections 1-8. Josef Houben, K. H. Büchel, H. G. Padeken, G. Thieme,Methods of Organic Chemistry (Houben-Weyl), Part 1, 1998, page 387-401.